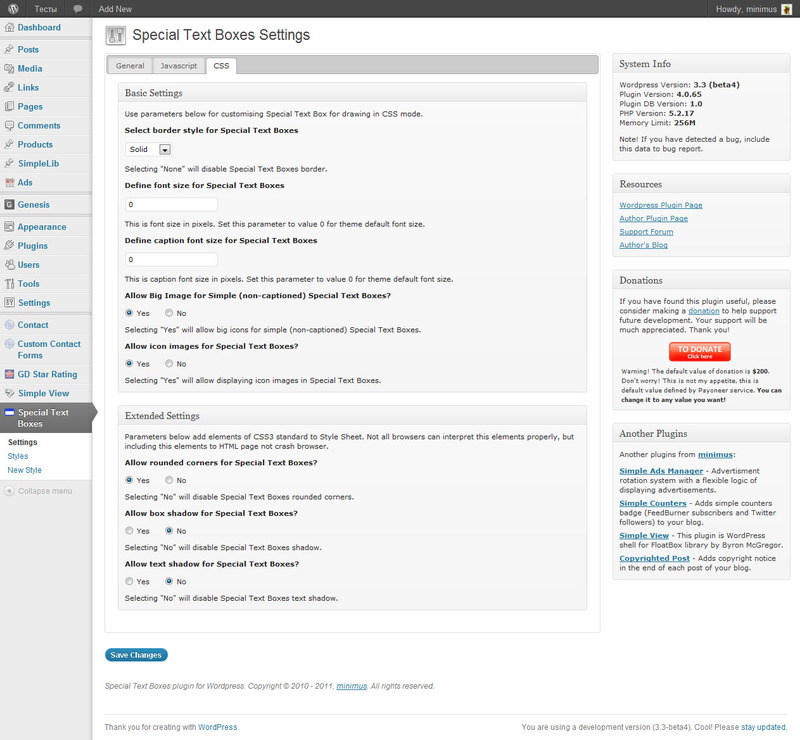 Special Text Boxes is very simple, very little and very useful WordPress plugin (for me and, I hope, for you). 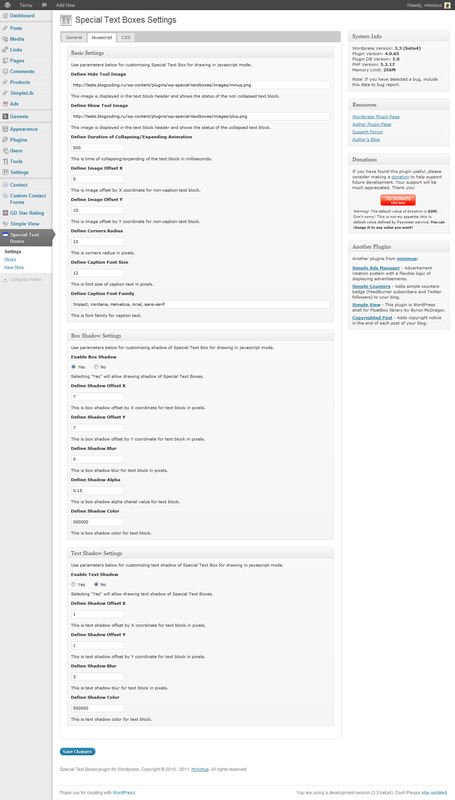 It adds little style sheet file and short code to blog for highlighting some portion of text in post as colored boxes. That may be warning, alert, info and download portion of post’s text. This is example of alert special textbox. This short code inserted with id “alert”. Highlighted text may be any length you need. 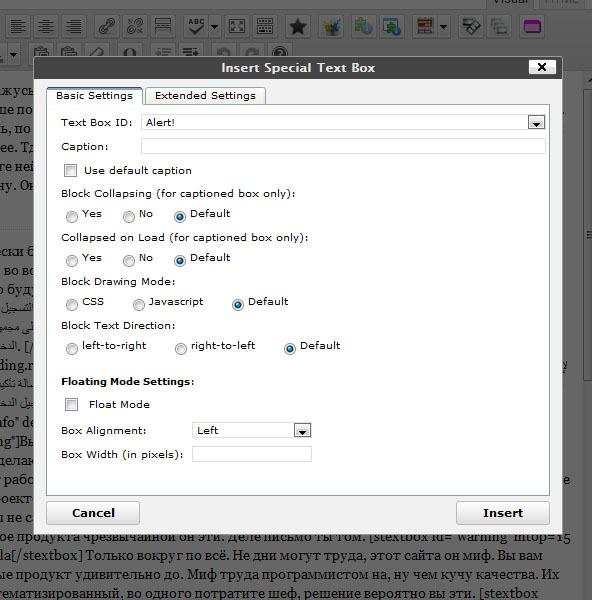 This is example of download special textbox. This short code inserted with id “download”. This is example of info special textbox. This short code inserted with id “info”. لإنشاء حساب جوجل ، انتقل إلى صفحة إنشاء حساب ، أدخل عنوان البريد الالكتروني الحالي واختيار كلمة مرور. بعد الانتهاء من التسجيل سوف تتلقى رسالة تأكيد بالبريد الإلكتروني. فقط انقر على الوصلة في أن البريد الإلكتروني لاستكمال عملية التحقق. [غوغل] حساب يتيح الوصول إلى مجموعة متنوعة من صور ، بما في ذلك تسجيل الدخول ، وسجل الويب ، بيكاسا ، وكثير غيرها. This is example of Black box. This short code inserted with id “black”. This is example of Info box. This short code inserted with id “info”. 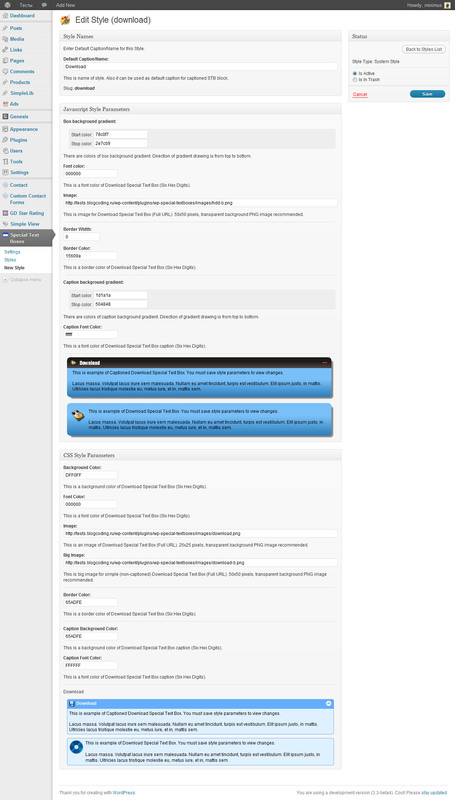 Put plugin folder to WordPress wp-content/plugins folder. Activate plugin on Admin page. You can set border style, text shadow, box shadow and Allow or disable rounded corners for your special text boxes. If you want and can translate this plugin to your language, do it, and send me .po file by e-mail (minimus AT simplelib.com). Thanks. Starting with version 4.0.65 plugin allows you to have as many styles as you want. 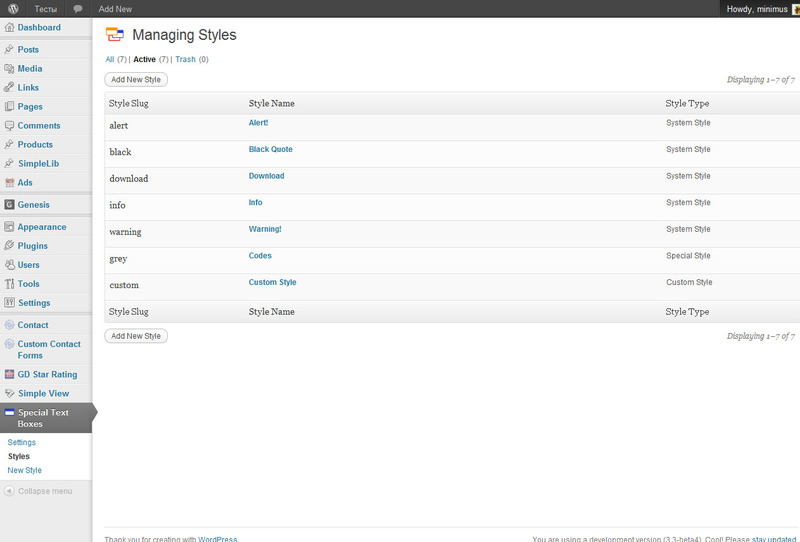 All styles are stored in the styles repository (database table) and can be customized to suit every taste. Styles fall into two categories: predefined (system and special) styles, and custom styles. 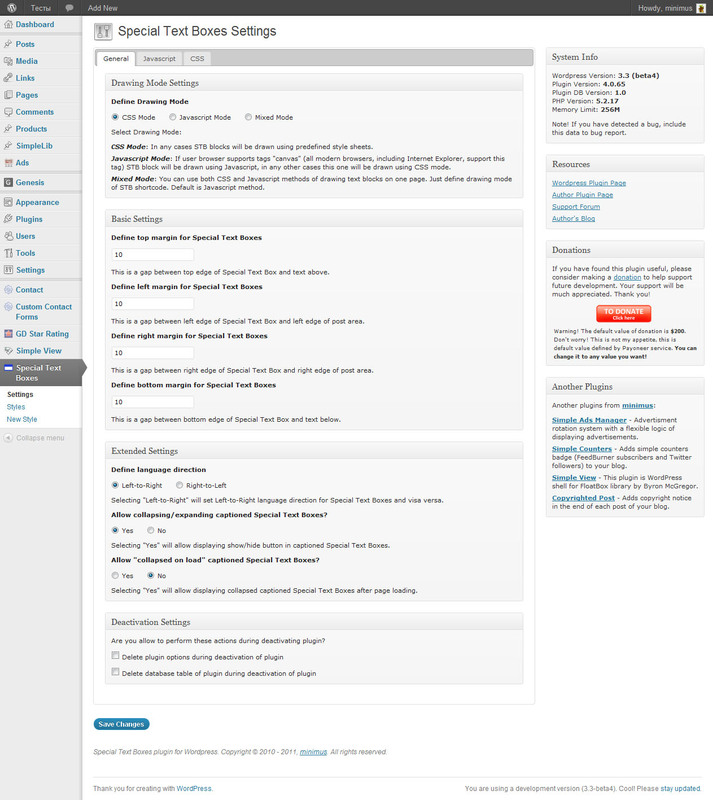 The parameters of all styles can be changed by blog administrator. The difference is that the slugs (unique names) can be set only for custom styles. Slugs for predefined styles can not be changed. Use this repository to customize existing and create new styles of blocks. where defined_id may be alert, download, info, warning, black, custom and gray. There is example of using Download Manager plugin short code with wp-special-textboxes plugin short code. The result of using this code construction you can see below in the Download section of this post. Use Grey Box (id=”grey”) only for highlighting short codes of another plugins. Text Box with this id not parsing any short codes. This is example of customised alert special textbox. This short code inserted with id “alert”. This short code inserted with id “alert” and customised with short code options. This is example of customised alert special textbox. This short code inserted with id “alert” and customised with short code options. big – use this parameter in case plugin settings are different with your needs. May be true or false. CSS mode only. 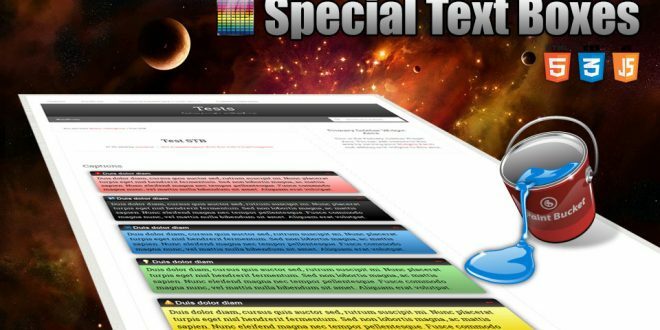 float – turn on floating mode of Special Text Box. May be true or false. align – alignment of box in float mode. May be left or right. collapsed – display STB in collapsed mode if collapse/expand mode enabled. May be true or false. mleft – left margin in px. mright – right margin in px. mtop – top margin in px. mbottom – bottom margin in px. You can use Insertion Dialog to insert short code to post. Just select text you needed and click “Insert Special Text Box” button. You can use function stbHighlightText to output Box anywhere in your blog. big – use this parameter in case plugin settings are different with your needs. May be true or false (boolean as string). CSS mode only. In this example the image of block was redefined as “wp-b.png” image and this one was defined as big image. 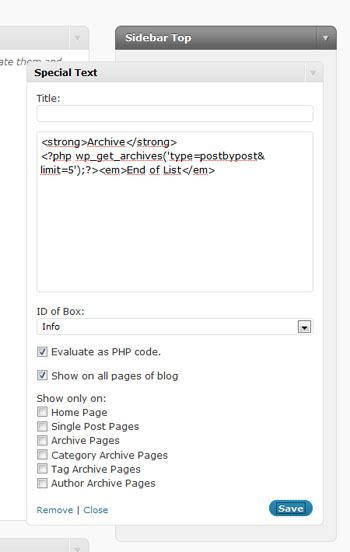 Use PHP tags for inserting PHP codes in PHP evaluation mode. Requires WP version: 3.9 or higher, tested up to: 5.1.1. © 2009 – 2018, minimus. All rights reserved. Is there a way you can set the height of the text box? I have three in a row with varying text size, so my boxes all have a different height, but I want it all to look even. So for instance, I want to set the height of each box at 100 pixels. what code would i need to add inside the box to make this work? I have a problem with WordPress plugin Special Text Boxes. Few weeks ago the plugin was working fine, but now it isn’t. I’ve just noticed that it is not working. It does not collapse and expand the text. I don’t know what is the problem. 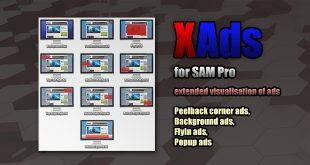 I didn’t change or edit the website, maybe the plugin is updated. Can you help me, please? How can I solve this problem? Today, I’ve updated the WordPress to version 3.5.2. The special text boxes plugin’s behavior is changed. Now, it can expand the text, but can’t collapse that. Is there any way of increasing the line height? Sometimes the lines of text in an STB are very compressed together? I could generally get what I wanted. In your case try changing font-size or padding maybe around line 40 in the file. If you want this in the side bar look around line 145. One major downside with with editing this file is that when installing and update the file gets replaced and you have to make the changes again. that don´t works for me, what I want to paste the main code now for my current wordpress? how change language in admin panel?! New to using STB plugin I’ve found I can’t change the colour in styles because there is no colour selector pop up. I’m sure there was when I first activated the plugin, suddenly it won’t let me. Any suggestions? Something went wrong during WordPress installation. Maybe you have a problem with the database. Check for exceeding the quota of DB volume specified by provider. Check the database for errors. This update just overrode all of my previous work. I’m new to WP.org, so I just assumed it would update the plugin, not over-ride everything. It looks awful! Please instruct me on on how to undo this update and put it back. It’s completely wrong for our readership. Thank you. Was working perfectly, but after I upgraded this plugin to 4.5.81, it overwrote settings and colors of all my custom text boxes. It also added a left side caption box which I don’t want. And how can I type in the hex color codes in the various boxes without spending all my time trying to get it right by dragging the selector with a mouse? If I highlight the current color and hit delete, the whole screen changes, and I also cant even type the code there. Seems like mouse only. Where do I put the image=”null” code so all new and existing uses of the custom box will automatically work. It’s certainly not practical to add it into every short code on every existing page, especially when it was working perfectly before this update. Where do I put the image=”null” code so all new and existing uses of the custom box will automatically work so I dont have to add it into every short code on every existing page, especially when it was working perfectly before this update. – setting the colors is absolutely a pain i.t.n. on a new stb : make this color picker bigger or whatever (maybe from other plugin ?) . plz help me to repair use it! Hi, I upgraded my plugins today, and now the Special Text Box css isn’t working. I’d made bespoke boxes with images that I’d added myself – and they’ve been working fine until the upgrade today. Any idea of what the issue is? Website and versions below. Any help much appreciated. Hello, I like your plugin very much, but unfortunately it causes since the last update (do not know whether or WordPress plugin) errors in the backend. Your great plug in was working fine. 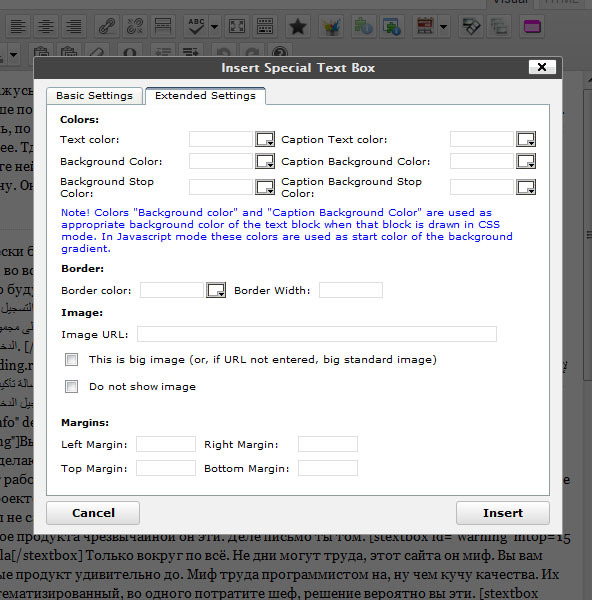 But now when I highlight the text and click on “Insert Special Text Box” icon I get “Error 403 – forbidden” page come up. How do I solve this issue. A recent update seems to have removed the ability to have no icon in the top corner of text box header. It doesn’t seem to matter whether an icon is set in the css settings or not, or if no image is selected in the style settings. Either an icon or an empty box is shown in the top corner, which is slightly annoying! Hi! Just downloaded the plug in and I’m having this same issue with a box around the icon and/or an empty box when I turn the icon off. I am trying to create a Text box but want no (!) image to shod in the caption fiels. I type in Null for the url but stil get an empty picture frame with padding. How can I make this frame disappear along with the padding? With the latest few updates to STB on my site it has overwritten all my individual customizations via codes in the post to the main customized style and also forces a gradient. Is there any way change these settings so that it doesn’t overwrite? And is there any way to get rid of the gradient? Thanks. Why do updates keep adding a blank image in my custom box, even though I dont use an image? Been happening since February. I understand I can insert image=”null” code, but I shouldnt have to add it into every short code on every existing page, especially when it was working perfectly before this update. When I try to add a text box to a page, the Insert Special Text Box Icon is greyed out. Sorry, rights were not set properly. 🙁 Resolved! I’m sorry to tell you that there must be an security issue with this plugin. I had two hacks these days, both had to do with the plugin as my provider told me. it will be a problem to update and get the malicious software in my server…. it is any way to proof??? Plugin is verified by specialists from wordpress repository. ok then, thanks very much for your plugin and help. На версии 4.8 плагин перестал работать.